Family together talking politics hell yes! Don't you mean just HELL? 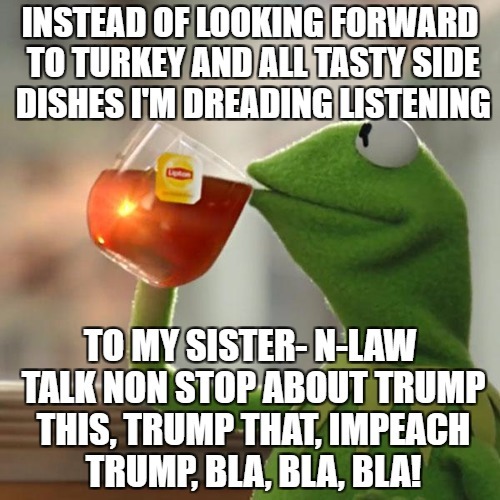 INSTEAD OF LOOKING FORWARD TO TURKEY AND ALL TASTY SIDE DISHES I'M DREADING LISTENING; TO MY SISTER- N-LAW TALK NON STOP ABOUT TRUMP THIS, TRUMP THAT, IMPEACH TRUMP, BLA, BLA, BLA!